This Thanksgiving, StoryCorps, the pioneering non-profit oral history project, undertakes its most ambitious initiative to date: the Great Thanksgiving Listen, which asks high school students across the U.S. to interview a grandparent or elder over the holiday weekend using the new free StoryCorps mobile app. Participants will upload their conversations—in which a generation of Americans will talk about who they are, what they‘ve learned in life, and how they want to be remembered—to the StoryCorps archive at the American Folklife Center at the Library of Congress. StoryCorps Founder and President Dave Isay, Chicago Public Schools (CPS) Chief Education Officer Janice Jackson and high school teacher Alex Fernandez took part yesterday in an event announcing CPS as the first major school district to commit to participating in the initiative. “We are thrilled to partner with Chicago Public Schools to launch the Great Thanksgiving Listen, which we hope will unify Americans in this time of great disconnect and division,” said Dave Isay, StoryCorps‘ Founder and President. “Together we will collect the wisdom of a generation and archive it for the future, while at the same time reminding our elders how much their lives and stories matter. 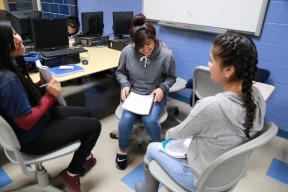 “StoryCorps allows educators to connect with students on a closer level and this shared experience carries on throughout the rest of the school year in the classroom,” said CPS World Language High School teacher Alex Fernandez. StoryCorps hopes to make the Great Thanksgiving Listen an annual tradition, and to continue fostering meaningful connections within families, communities, and the classroom while also creating a singular and priceless archive of American history and wisdom.